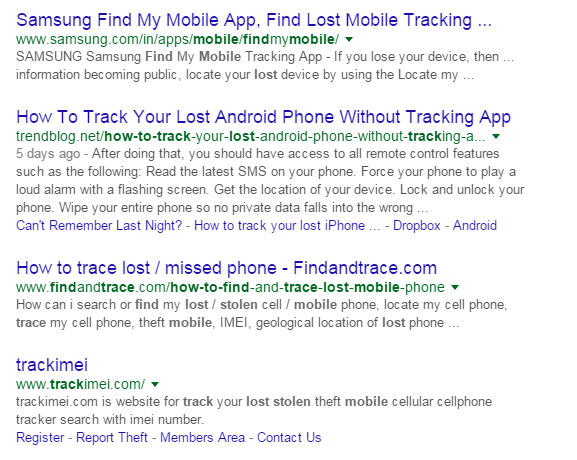 When a person lost his phone or tablet then the first step done by him is to find articles in Google like, 'how to find lost mobile', 'how to find lost android phone', 'find android phone', 'trace IMEI number' and many more other search phrases.But after a very long research today am here with a simple way to find your lost mobile phone, Android or simple it will does not matter because the way am going to tell you is totally based on tracking using IMEI number and anybody can easily find this number by dialing *#06# on their mobile phones. It will show you 15 digits number so save that number at any safe place because you will need that IMEI number in future if you lose your phone. What to do if you lost your mobile phone and you don't have IMEI number? Don't worry I will tell at the last of this post about how to get your IMEI number even after losing the phone? Keep reading! I also did a post about how to locate android phone if you misplace at home by using a android app, but its totally different from that and it will work to find lost mobile phones not to locate misplaced phones at home. Full form of IMEI is International Mobile Equipment Identity and is a unique number given to every single mobile phone. Think if the steps shown in image is easy then everyone can recover their lost android devices, but in reality nobody can able to find their mobile phone's after reading these type of articles. At last they adopt only the way to make FIR at police station and I think again nobody is going to get their mobile phone's back. Then Why People are writing these type of articles with false title which do not work? After reading the above lines written by me, mostly people will think that I am just making false estimations for that articles and I am right then why those people are making false articles? I have a exact answer: Because those people are bloggers and they write only to drive visitors on their blog to get paid by ad networks. They do not care about there readers and write posts copying from someone's else. But also some of them are real and genuine ways and also sometime the steps are very complex suggested by them. 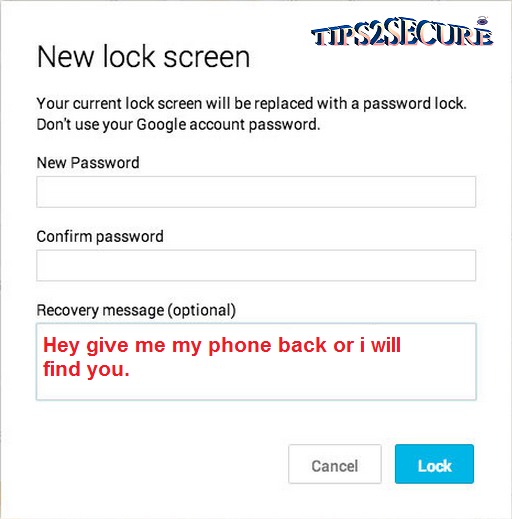 So now get ready for the steps to be done to find your lost android phone as well as simple phones. You have to Send a email cop@vsnl.net in following format. You can find your IMEI number on your phone box and on bill also if you lost your phone before noting the IMEI number. Now send this email to cop@vsnl.net and wait for reply from them, if your phone is being used by someone then they will trace and confirm you. Remember they will reply you only if your phone is in use, otherwise you won't get any reply from them. Just visit Android Device Manager Website and From here, you can select any of the Android devices you have linked to your Google account. If you think you lost your phone at your home in silent mode then select 'Ring' and the device will start playing its ringtone for about five minutes and when you find it, press the power button to stop it. Simply you can track your phone online also by using chrome on windows on Android device manager website or you can also download android app from playstore to track your phone. Use only that google account to find your phone which was already associated with your google account. Here in this post I have written about two different methods. First method may not work in some cases but second will work definitely for you as second step is totally managed by google and that's why divided second step in sub parts to make clear each and every thing to our readers. There are also lot of other services available on internet who claims to track android devices using IMEI number but that's not working and may not give you the real locations. So According to me you must try only both the given steps to locate and find your lost mobile phone's instead of wasting time on searching for other articles on google. Must share this article with your friends also as it may help them to locate and find their mobile phone's also. 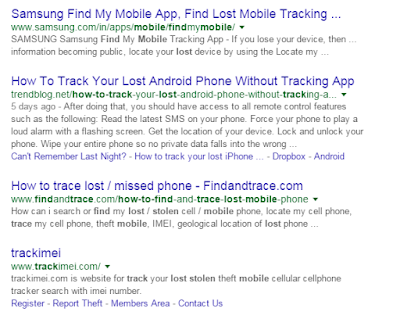 Message: I hope that you have enjoyed 'How to Find Your Lost Android Mobile Phone Using IMEI Number ' article. However, if you want me to deliver more articles then please share my post. You can use Social Sharing Widget provided at the end of every post. After all, Sharing is Caring!. Locating by imei is effective, but if you lost the box from your phone you should use gps trackers to locate phone (or any other needed device) and control their activity. 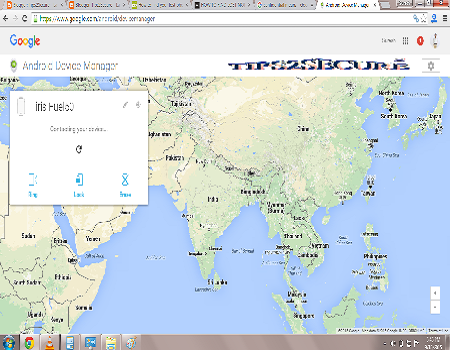 You can also use free online IMEI Tracker to trace down your lost android phone.